In 2011, Austra garnered critical acclaim for their debut album; Feel It Break which featured the operatic charged single “Lose It” as well as the darker edged “Beat and the Pulse”. In the early summer, Austra’s second album came out on Toronto’s Paper Bag Records. Recorded mainly in Michigan, Olympia was more of a collaborative effort between the three core band members (along with co-lyricist Sari Lightman) than the mainly bedroom project of their debut. Like Feel it Break before it, the most striking aspect of Olympia is lead singer Katie Stelmanis’ classically trained voice. This adds an extra layer of vulnerability to early standout “Forgive Me” where she pleads, “What do I have to do to make you forgive me?” and lends further intrigue to the single “Painful Like”. 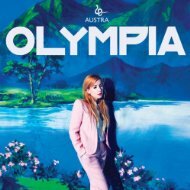 While retaining the iciness of the debut, Austra has added live instrumentation to tracks such as “Home” and the excellent “We Become” which brings a more human element to their sound. There may be a lack of punchy singles that propelled Feel It Break but ultimately Olympia feels like a step up in songwriting as highlighted on stark album closer “Hurt Me Now”. You can see for yourself when Austra return to Winnipeg with a highly anticipated show at the Garrick Centre on October 5th.